During his turn, if Xun You has at least one hand card, he can use his entire hand as any non-delay tool card. Whenever Xun You is damaged, he can draw a card and then shows everyone his hand. If all the cards are the same color, the source of damage must discard a hand card. During "Element of Surprise," Xun You uses his entire hand as a single non-delay tool card. He will have no cards left after this maneuver. "Element of Surprise" provides Xun You with one tool card, no matter how many cards are in his hand. For example, if Xun You has five hand cards and uses "Element of Surprise" to play Barbarians, the net effect is that Xun You will discard the five cards to play Barbarians once. When Xun You plays Barbarians when using "Element of Surprise," Zhu Rong is not affected by the tool card as per "Giant Elephant," but she cannot pick up the used hand cards. The color of the tool card that Xun You uses in "Element of Surprise" is determined by the colors of the cards that Xun You discarded. If his entire hand is red or black, the tool card will be the color of the hand cards. If Xun You has both red and black-suited cards in his hand, the resulting tool card will be colorless. 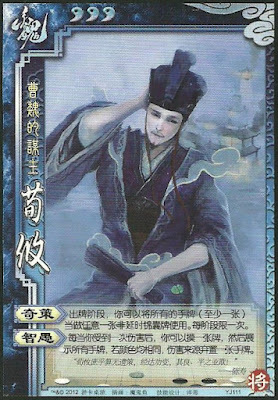 If Xun You is damaged without a source, as with Lightning, he can still draw a card from "Wisdom and Foolishness." Since there is no source of damage, nobody would need to discard a hand card if all of the cards are of the same suit. If Xun You has no hand cards when damaged and he activates "Wisdom and Foolishness," he will draw one hand card. Since all of the hand cards are of the same color (all 'one' of them), the source will automatically have to discard a hand card. If the source of damage has no hand cards after damaging Xun You and he activates "Wisdom and Foolishness," the source will not have to discard any cards. When Xun You is damaged and activates "Wisdom and Foolishness" he must show his hand to all players, not just the one who damaged him. Note that "Wisdom and Foolishness" is activated on a 'per-instance' basis. If Xun You receives more than one unit of damage in one instance (such as when he is damaged with an Attack with Wine), he can only draw one card and the source would only have to discard one hand card (assuming that all of Xun You's hand cards are of the same suit). Xun You has many options with "Element of Surprise." In particular, Barbarians, Hail of Arrows, and Peach Garden seem to be the most useful as they affect all characters in play. If Xun You's allies are Zhu Rong and/or Meng Huo, he can use Barbarians to cause trouble for his enemies and not his allies. If multiple allies have Eight Trigrams, Xun You can use Hail of Arrows since his allies will likely have an Escape. If more of Xun You's allies are damaged than his enemies, he can use Peach Garden. If Xun You has one weak target that he wants to damage, he can use Duel. If Xun You wants to keep a low profile at the very beginning of this game, he can do this while still possibly causing a lot of damage. He can do this by not Attacking anybody and simply using his entire hand as either Barbarians and Hail of Arrows. The other players will not know what to think and may not risk hurting him in case he might be a teammate. As the match goes on and other players reveal their roles, this tactic will lose its effectiveness. Xun You is surprisingly robust against card destruction techniques. He only needs one hand card during his turn to activate "Element of Surprise." This usually is not a problem since he draws two cards in his drawing phase. Xun You's two abilities seem to work well together. "Element of Surprise" will leave Xun You with no hand cards (unless he used the Draw 2 card), then when an enemy damages him and he activates "Wisdom and Foolishness," the source will automatically need to discard a hand card because all of his hand cards will have the same color. The most powerful options of "Element of Surprise" affect everyone at the table, whether they are enemies or allies. Sometimes Xun You can choose carefully between Barbarians and Hail of Arrows to minimize damage caused to allies, but this is not always possible to avoid. If Xun You has very useful cards in his hand (like Peach), he may not want to use "Element of Surprise." Xun You is powerful, but also very fragile. He has only three units of health and "Wisdom and Foolishness" is quite weak. It only gives him one hand card. While the source may have to discard a hand card, this is not often a big deal. Xun You is particularly weak to Attacks with Wine and Attacks from the Scimitar. "Wisdom and Foolishness" requires Xun You to show the entire table his hand. His enemies will know what cards he has and how they can damage him on their turns. Also, if they see that he has two cards of different colors, they will not be afraid to damage him at all. Cao Cao - Cao Cao is a great teammate for Xun You because of his "Evil Hero." 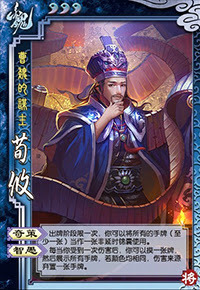 Xun You can convert his entire hand into one tool card, then Cao Cao can acquire all of the cards discarded by Xun You when he activates "Element of Surprise." Xun Yu - Xun Yu's "Eternal Loyalty" allows him to refill Xun You's hand after he uses all of his hand cards in "Element of Surprise," mitigating Xun You's weakness of having to discard his entire hand to use this ability. Meng Huo/Zhu Rong - These characters are immune to Barbarians. Xun You can use Barbarians to target the rest of the characters in play and keep them safe if they are on his team. Yang Xiu/Xu Shu - These characters have a defense against "Element of Surprise." They are good teammates when Xun You is on their team, but they can be annoying enemies because they make it harder for him to use his ability to cause more damage to his enemies than to this friends. Cao Pi - Cao Pi seems to have a lot of leverage against Xun You. If he flips Xun You's character card, Xun You will lose his next turn and the opportunity to use his most powerful ability "Element of Surprise." Also, "Wisdom and Foolishness" is not a very good ability to rely upon to survive until his next turn. Dong Zhuo - Dong Zhuo has many units of health and he can easily Attack with Wine, making him a powerful enemy against Xun You. King Xun You is a mediocre king pick. He is similar to Yuan Shao in that he can target the entire table with "Wisdom and Foolishness," but he is so fragile that he might not last very long against aggressive rebels. Loyalist Xun You is a good loyalist. His abilities can be used to target all of the rebels and cause a large amount of damage in a short amount of time. Rebel Xun You can also be a good rebel. If the king is low on health and hand cards, he will likely be able to find a way to kill him quickly. However, he has to be careful when he is low on health, as he is fragile and he has a three card bounty on his head. Spy Xun You is a risky spy pick. On one hand, he can do a large amount of damage in a short amount of time. He can easily target everyone else on the table with "Wisdom and Foolishness." However, it is sometimes difficult for him to change the balance of the game because he often targets everyone on the table. Additionally, he is fragile and somewhat of a high-profile character. Xun You may look like a geek, but he is a powerful and fun-to-use character! He works well in both team and one-on-one situations. Realize that "Element of Surprise" gives him a lot of options and that the best one is not always obvious. If you are not going to use "Element of Surprise," try to finish your turn with all of your hand cards being the same color so you have a 50% chance of forcing an enemy to discard a hand card if they damage you and activate "Wisdom and Foolishness."